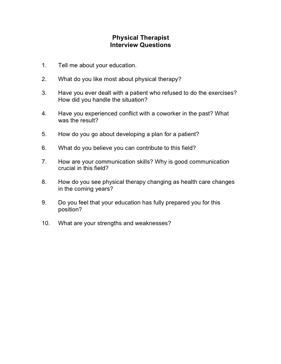 Choose your next Physical Therapist with the aid of these helpful interview questions. 2. What do you like most about physical therapy? 3. Have you ever dealt with a patient who refused to do the exercises? How did you handle the situation? 4. Have you experienced conflict with a coworker in the past? What was the result? 5. How do you go about developing a plan for a patient? 6. What do you believe you can contribute to this field? 7. How are your communication skills? Why is good communication crucial in this field? 8. How do you see physical therapy changing as health care changes in the coming years? 9. Do you feel that your education has fully prepared you for this position?